I’m a newbie with letterpress dreams but all I have right now is a new-to-me broken Kelsey 6x10. It just arrived in the mail today with a broken impression lever and I am so sad. Can it be repaired or do I just return it and start the search over again? Thanks for your advice. I’m a newbie as well, so this answer may miss the mark a bit. However if I’m not mistaken, I believe that you may have luck with T&T restoration. Their info can be found here on Briarpress. Good luck! Depending on where you bought it from, I’d look at their return policy- they obviously did not properly crate the press for shipping, so I’d try to return it. Did you have shipping insurance? If you’re not able to return it, someone may have spare parts- I would look for a replacement part before having this part repaired, as that handle takes a lot of force- and may break again. But T&T is your best bet for repairs if that’s your only option! Thanks for your insights. The seller has indicated that he can only pay for a repair of up to $150. Does that seem reasonable? Here’s the update: I am now the proud owner of this broken Kelsey 6 x 10 as eBay refunded me my money and the seller can’t pay to ship it back. Do you think it’s worth it to repair or that someone could use it for parts? Thanks! Personally, I would repair it, but I hate to see these machines die and I have local access to excellent metalworkers whom I know well and trust. 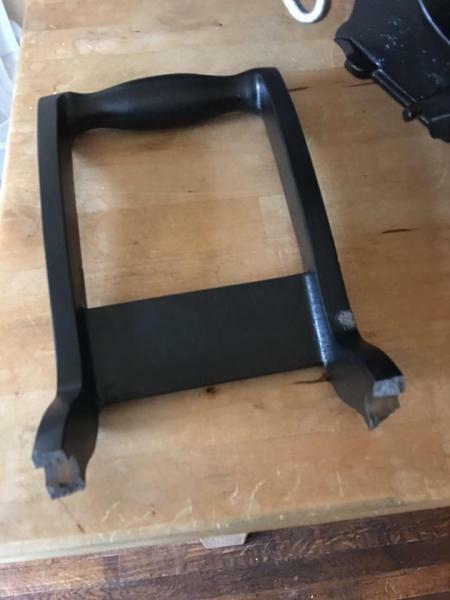 Having your press welded and reinforced in a similar fashion to the one I posted before would make it as good or better than new. I’ve put something like a thousand impressions on this press since it was repaired and it has worked fine. Granted, it’s not as high-wear a spot as your break but it’s still got to withstand constant motion and spring pressure. It’s not flexed or budged a hair. If I were you, I’d talk to T&T Restoration or someone similar about repairing it. If it’s more expensive than you’re willing to take on, sell it as a complete machine to someone who can get it fixed. Since you got your money back, you won’t have lost anything no matter how cheaply you sell it on. @Nicholas, I’m not sure the Kelsey model number. 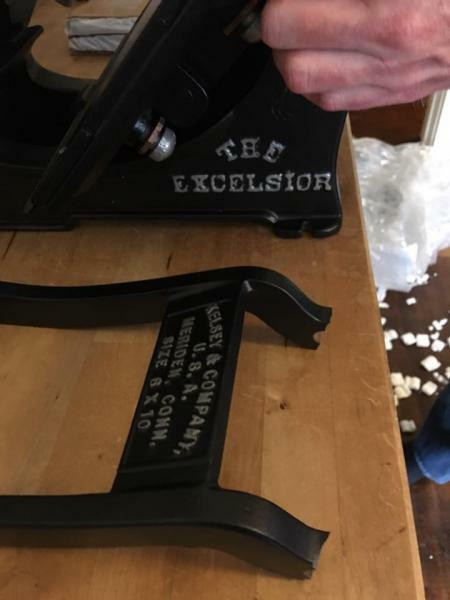 It’s a 6 x 10 Excelsior, cast-iron. @mephits: I feel the same way. I’m weirdly bonded to this broken machine, even as I’m waiting for my Adana to arrive from the UK. Will contact T&T and the local machinists to see what advice they can give me. Would you be willing to sell your broken press? I have a press that need the other parts that your press has. Or I can sell you the press that I have that needs a bed and chase. I too might be interested in the handle connectors, my Model E has a broken one. 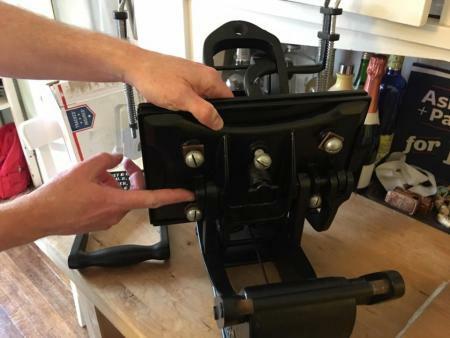 I’m investigating locally (Oakland, CA) how much it may cost to repair my press to functionality. Will get back to you after that. I hope you get T&T to fix it. Its too easy to fix that thing, so parting it out would be a crime. because they are afraid of this. Its so sad to part out presses to keep them going. Im REALLY starting to think about starting a business making replacement parts to keep these things going. BTW, Im near Oakland too. What part of contact T&T restoration do you not understand?????? Several folks here have tried to steer you in that direction. They do EXCELLENT work and are EXPERTS at this sort of thing. Trying to find someone local or “just starting a repair business are most likely NOT going to do a sufficient repair that won’t soon break again on you. YES, the press is well worth paying a decent price to get PROPERLY repaired. This is better than a 5” x 8” Kelsey which already sell for outlandish amounts of money. Maybe you have contacted T&T and didn’t like the repair price or whatever? But in my opinion this is THE place to get your press back in working order.